Our Principal, Steve Hills, is currently the only RYA Cruising Instructor Trainer (sail) in Greece. 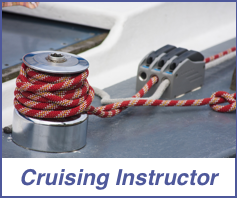 Qualified RYA Cruising Instructors can teach Competent Crew and Day Skipper practical courses. To become a RYA Cruising Instructor you must firstly hold a commercially endorsed Yachtmaster Offshore certificate of competence, have completed the RYA’s online PPR course and, a short online pre-course knowledge check. You can then attend a five day training course, during which you will learn how to teach through a number of role playing exercises. On the final day of the course a RYA Moderator will attend to provide an evaluation of your suitability to become an Instructor. Price includes all tuition, accommodation on a school yacht, fuel, mooring fees, use of wet weather clothing and Greek VAT at the appropriate rate.